This entry was posted on Friday, February 17th, 2012 at 12:00 am and is filed under Comics. You can follow any responses to this entry through the RSS 2.0 feed. Both comments and pings are currently closed. 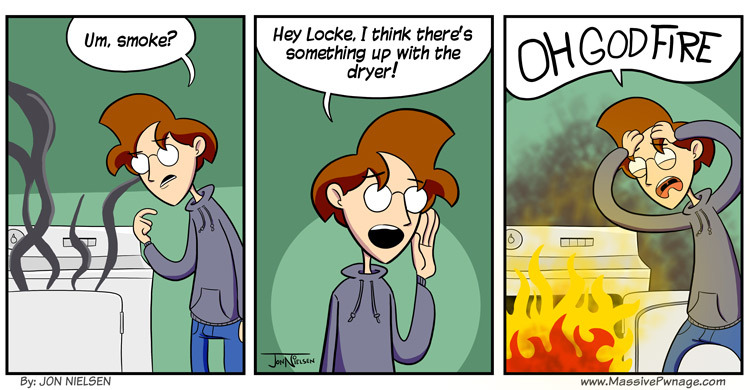 That funny because my gas dryer caught fire yesterday…. Everyone from knows to “fight fire with fire” since he started in grade school! d. Use Frostbite or Blizzaga to put out the flame and destroy a nearby wall. Is this by chance a Sims reference? Because it feels like a Sims reference. We all know it was you, Tika. I remember being a kid and my house lit on fire because the window had been left open and a candle was out and lit. (ironically a stress relief one my mum was using). Every time I use my stovetop, sparks fly out underneath the glass surface. There’s also several damaged wires in the kitchen wall. These two things may or may not be related.